Like many people, one of my goals for this year is to exercise regularly. I’m a light exerciser, meaning you will never ever find me at a CrossFit studio. I much prefer neighborhood walks and yoga, and not just because I’m lazy. My light bone structure just seems better suited to lighter forms of exercise, and high intensity workouts often leave me hurting and depleted. I am learning to honor that rather than struggle against it. Still, everyone needs to break a healthy sweat every now and then. I find that when I exercise at least a couple of times a week, I’m less anxious and more energetic. Enter Sworkit, my favorite exercise app, and the one I am using regularly this year to ensure I get a little healthy heart pumping going each week. A friend actually introduced me to Sworkit a year and a half ago, and I’ve used it occasionally since then. This year, my goal is to exercise (either a Sworkit session or a yoga video by Adriene) at least three times per week. My favorite thing about Sworkit is that you don’t have to leave your house, and it requires no equipment. There is a zero percent chance that I am going to stick to a workout routine that involves having to drive to the gym. 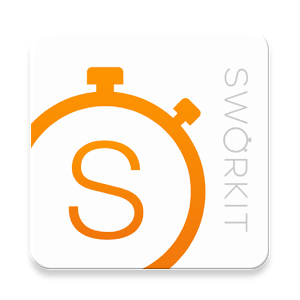 I love Sworkit because there is no prep time and no driving time. All you need is a pair of tennis shoes and five minutes, and you’re ready to go. As someone who constantly feels busy, schedule flexibility is essential, and less time is definitely more. 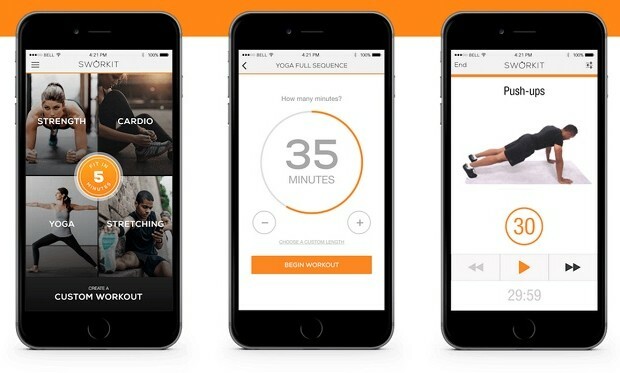 The app has several different types of workouts: strength, cardio, stretching, and yoga (though I don’t really recommend the yoga on this app…check out my favorite at-home yoga videos here). From there, you pick a sub-category (for example, “full body” or “core strength” under the strength category), and then you select how much time you want to spend. A lot of the cardio workouts are pretty high intensity, at least for me, so I typically will only spend about 8 minutes on a workout. That’s all I need to break a sweat, get my lungs and heart working big time, and reap the benefits of boosted energy and clarity of mind. How much easier could it be? I don’t use many of Sworkit’s other neat features, such as push notification exercise reminders and number of calories burned, but they’re there and presumably very helpful if that’s something you’re into. Asana Rebel yoga app review by Traci at Choosing Better. Fitness gadget comparison by Liz at The Restless Wild. P.S. – This is not a sponsored post. I just love sharing things that I love with my belles!